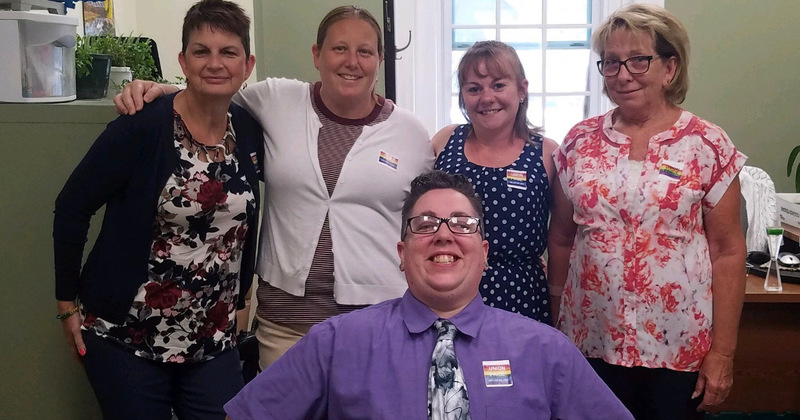 When the town of Greenfield entered negotiations with UE Local 274, which represents the town clerical and library workers, their agenda was clear: more rights for bosses, fewer rights for workers. Management wanted to expand the management’s rights clause while removing all non-discrimination language from the contract, leaving any issue of discrimination up to state law. After nine months of negotiations, including the first-ever public-sector mediation by a UE local in Massachusetts, Local 274 remains the only union representing town workers that has not given management expanded rights, and they preserved and even expanded the non-discrimination language. UE members knew that they couldn’t allow an expanded management’s rights clause, and prepared for a long fight. A bargaining unit made up primarily of women, members of the LGBTQ community and other discriminated-against groups, they were also committed to preserving their ability to fight discrimination through their union grievance procedure. The intent of management’s proposal to remove non-discrimination language was demonstrated by their own behavior: during negotiations, the local had a third-step grievance in process that was rooted in discrimination against an LGBTQ UE member. Local 274 won that grievance after the members banded together and started a sticker campaign. Members wore stickers every day which showed their local union number over a rainbow flag and were seen by both management and the public. After multiple mediation sessions, Local 274 persevered on the issues of management’s rights and non-discrimination. They also won an improved grievance procedure and better language on sick leave so that management can no longer make arbitrary decisions about what is or isn’t satisfactory verification for being out sick. The new three-year agreement decreases the probationary period for almost all positions in the unit. In the layoff, bumping and recall language, the union was able to get rid of language that required employees to take eligibility tests for positions they wanted to bump or recall into. Workers will see a one-time wage adjustment of one percent and a two percent cost-of-living adjustment in the first year of the contract, retroactive to July 2018, and a 1.5 percent wage increase in the second and third years. The bargaining committee was made up of Diane Holmes, Kay Lyons, Kim Mew and Paula Morse. This was the also the first all-female bargaining committee for the local. They were assisted by Field Organizer Abbie Curtis.